It's one of those times of year again. Typically cameras tend to get promoted heavily in Spring (for Mothers/Fathers day, graduation, summer vacations) and then again at Christmas. The EOS M5 I like (see review) has a US$50 discount on it (plus 2% B&H future purchase award), no matter whether you select body only or the body with kit lens. Add the 18-150mm lens instead and the discount increases to US$280. My problem with the 18-150mm is the wide end: it isn't really wide, being something near 30mm equivalent on the Canon APS-C sensor. But couple that with the very good 11-22mm EF-M lens, and you've got a smallish two-lens kit that goes from very wide angle to strong telephoto. The EOS M6 also has a discount with the 18-150mm, but the EVF on the M5 is well worth the extra US$100, don't fall for the M6 unless you're given a real extra incentive to opt for it. The EVF is worth way more than the implied US$100. The just-introduced X-T20 already has a small (US$50) discount on it. Much of the goodness of the X-T2 (see my just-posted review) is in the X-T20, but at just above half the price. Likewise, the recently announced X-A3 model is also on sale, giving you a two lens kit for just US$699. That's pretty darned good for a near state-of-the-art 24mp APC-S sensor-based system. The downside? No EVF. So this becomes a possible compact camera replacement for some. The rest of Fujifilm's rebates are for previous generation gear. Given that Fujifilm just went from 16mp to 24mp and improved their focus system considerably, I'd tend to stay with the current gear. The GX-85 is a pretty decent rangefinder-type mirrorless camera with a lot of capability in it (as usual with Panasonic, 4K video, for instance). With the new discounts, you get a two-lens kit for about US$700. I'd judge that to be a good price for that camera. While I haven't reviewed it, I did borrow one for a couple of weeks and found it to be much like the other recent Panasonic cameras using that 16mp sensor: very good image quality, pretty photographer friendly, excellent video, and excellent build quality. If you want 20mp, the similar but slightly more upscale GX8 bodies are now under US$1000 and coupled with a free kit lens. Meanwhile, the outgoing GH4—a staple among 4K videographers on a budget—now breaks the US$1000 mark. Not a bad price for a darned good 4K video camera. A ton of savings here. I'm going to call out the ones that I believe are the real bargains. First up we have the A6300 two lens kit, which gets you about 24-300mm equivalent in a pretty small package, and at a good price. At US$350 off it's worth thinking about if you want a small, portable mirrorless system. Yes, the A6500 has more tech in it, but the A6300 is more than a competent camera (see review). Besides, if you really want the A6500 and that lens bundle, you can pony up more than US$500 and get it on discount, too. Still, I think the A6300 is more the sweet spot for this type of camera. If you're looking for bargains, the A6000 is also available with the two-lens bundle for US$800. So pick your poison. For most people, that would be the A6300, IMHO. Most of the A7 series discounts are mild or big bundles of stuff. I suspect we'll see more discounting on that series in the future as we near the Mark III models appearing. The original A7 (no r, s, or Mark II) is now under US$1000, which might attract those experimenters willing to sample the Sony system. 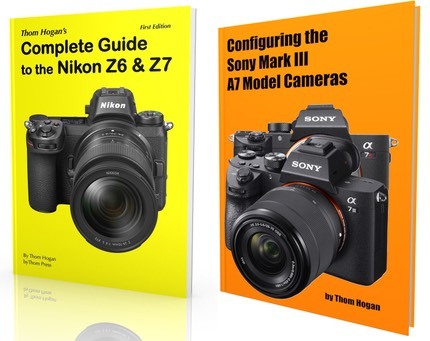 But now that we've seen the changes in the Mark II models and what might be on tap for future ones with the other recent Sony introductions, I'd tend to say avoid the original body unless you think you'll just eventually use it as a backup. The 70-200mm f/4 FE lens has a US$100 discount. Very reasonable price for a very good lens. If you don't have this or the f/2.8 version in your FE kit, you don't have a flexible telephoto lens with strong optical performance. Most of the FE lenses Sony is offering at discount have modest rebates: I don't see any particular bargains there other than the 20% savings on the 50mm f/1.8, but by all means take advantage of discounts while they're available if you need those lenses. With the E lenses (APS-C crop for the A5xxx and A6xxx) models, there are three lenses that have discounts you should note: the very good 10-18mm f/4 OSS is US$100 off, which is a 12% discount. The already modest priced 35mm f/1.8 OSS and 50mm f/1.8 OSS have US$50 discounts. All three of these lenses should be in any A6xxx kit. This article is a bit of an experiment. I generally don't tend to post pointers to sales. So if you liked this and want more articles like it more often, please let me know. Likewise, if you'd rather I didn't do this, let me know that, too.